Blitz said the question is answered with the evidence of material remains left by ancient Native Americans, the location of the finds, what remains are found together in association as well as the form and function of the artifacts. From 2004-2016, he directed archaeological excavations at Moundville every year with the assistance of UA graduate and undergraduate students. Together, Blitz and the adventurers examined two types of artifacts: everyday tools used by Moundville’s people and highly crafted special-purpose artifacts. 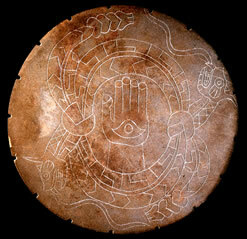 The common artifacts were items such as a stone axe, arrow points, clay pots and finer pottery used for serving food. The “Duck Bowl,” which is on display in the Jones Museum, represents a supernatural version of a waterfowl. 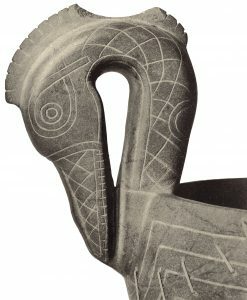 The special-purpose artifacts included the famous “duck bowl,” a large stone bowl crafted in the image of a bird-like creature, the “rattlesnake disk,” a stone disk engraved with entwined snakes, and the “hand-and-eye” motif in addition to various copper and shell ornaments that marked the social status of important people in Moundville’s society. This program will be available as an interactive streaming event in which students in classrooms across Alabama can ask Dr. Blitz and other experts questions about archaeology and Alabama history. “Archaeology Adventures” can be streamed live using an internet connection and computer or mobile device on Nov. 30 at 10 a.m. More information is available at aptv.org/archaeology. APT’s IQ Network has been producing Learning Adventures, or interactive streaming field trips, since 2011. The network is producing four Learning Adventures for Alabama’s bicentennial celebration, of which “Archaeology Adventures” is the first. In addition to the Moundville program, “Archaeology Adventures” will travel to the Old Mobile, Fort Toulouse and Old Cahawba archeological sites. Described as the “Big Apple” of the 14th century, Moundville was one of America’s largest settlements north of Mexico 800 years ago. This National Historic Landmark, part of UA Museums, contains 320 acres with more than 29 preserved prehistoric Indian mounds, campgrounds, picnic areas, boardwalk nature trail, theater, Riverbend Lodge and a museum containing some of the finest Mississippian-era artifacts in North America. 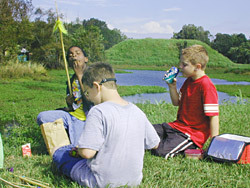 The park is located 16 miles south of Tuscaloosa on Highway 69 in Moundville.